Tired of reading this stuff? You're in luck! Between the Horns is now a monthly segment on the 9sense podcast! Hosted by Rev. Adam Campbell of the Church of Satan, 9sense is an informative, stimulating, frequently amusing forum for the discussion of Satanism and relevant topics. I have popped up in a couple of past episodes, but now it's a thing. And what a thing! You can listen to the first episode featuring Between the Horns here. 9sense is a weekly show, and my segment is currently scheduled for the first episode of each month. I am excited to join this show's diverse roster of outstanding contributors! Satanism is not Devil-worship. No matter how often we restate this, misunderstandings persist. Anton Szandor LaVey codified this religious philosophy under a name that, while accurate, had hitherto been used almost exclusively as a religio-political slur against assorted heretics, freethinkers, and pagans. But Satanism is far more controversial than the pastel Luciferianism of the Impressionists, and the history of slander against it spans millennia. And yet, with the founding of the Church of Satan in 1966, Satanism transubstantiated from a scandalous accusation into an unconventional means of self-realization. Unlike its theoretical caricature, genuine Satanism evolved from atheism. After all, the mythological Satan doesn’t worship any gods above Himself. Neither do we. Every Satanist is his or her own god. You can’t get more Satanic than that! LaVey’s unprecedented formulation organically integrates the full spectrum of the Satanic, from traditional ritual trappings to literary predecessors to previously unidentified strains of cultural resonance. With LaVey came the first definition of Satanism that is truly Satanic, through and through. It is a comprehensively sound work of conceptual architecture. Each and every element is integral to all the others. Even so, the resulting structure allows for infinitely varied elaboration in accordance with the idiosyncratic passions of each individual Satanist. Satanism is not a faith, but an augmentation. Satanism applies the principles that define the very nature of Devils: the rejection of external gods, the embrace of carnality, and a stance of honest individualism. Again: Satanists do not worship Satan. Rather, we emulate that mythological figure’s most productive qualities, rejecting the rest as anti-carnal propaganda. This very act of defining Satanism, and correcting its misrepresentation, is a Satanic act unto itself. Ours is the most accurate definition, and quite naturally resisted by many who subscribe to an un-Satanic worldview. They simply cannot grasp what comes so naturally to us. And we cannot afford to forget that, lest we commit the sin of solipsism. We insist upon this differentiation between Satanism and Devil-worship, pushing back against endless misunderstandings, because these efforts sustain the religious philosophy that enriches our lives beyond measure. On a personal level, I would like to give others a chance to experience the unexpected exhilaration of self-discovery that I enjoyed at age thirteen. As Magister Nemo writes in “Satanism Needs an Enema!”: “The Satanic movement is ideas. The wrong ideas can kill what is truly Satanic in our efforts and leave us just another mindless cult.” If an already Satanic individual comes across too much misinformation before rejecting Satanism altogether, we will have lost the full emergence of a remarkably inspiring peer. So, if we reject the supernatural definition of Satanism, why do we use the name? LaVey admits in The Satanic Bible that “they” named our religion. But, being anti-Satanic, most religionists interpret Satanism through the lens of their own mythological prejudices. Yet the hegemony of spiritual religions has, through the course of human history, solidly established the groundwork of what is considered Satanic. This provides a context for us that could be alienating, but which we adapt toward our own stimulation. The only problem is that they have also projected their own faith-clouded ideas into their conceptions of Satanism, thus accusing us of their own compulsive fantasies. And so it is up to us, as Satanists, to continue asserting the definition of Satanism ― from a truly Satanic point of view. I have launched a new Tumblr blog titled "The Satanic Dictionary." Working from a master list, I will be sporadically updating it, in no particular order, to compile a reference that may come in handy for anyone seeking concise definitions of core Satanic terminology. Since I am a Warlock in the Church of Satan, these entries are written with the express intention of reflecting that organization's principles. Entries are written in as straightforward a manner as possible. It is not an encyclopedia, and complete understanding may require further research on the reader's part. But as LaVey always said, "Satanism demands study, NOT worship." The original plan was to write and release this as a complete book, but the accessibility and interactivity of a Tumblr blog ultimately seemed more desirable, at least for now. Blogging allows for the gradual development of this reference as it evolves, and its searchability makes it more useful to others along the way. Since I just celebrated my Birthday, I have begun with nine entries relating to that highest of holidays, along with the ego, pride, and other correlating terms. This was also a good way to begin cross-referencing through links within the definitions. It is a pleasure to finally have this idea taking shape. As a lover and lifelong collector of dictionaries, I am thrilled to be developing such a reference dedicated to the religion that enhances every aspect of my life. The Satanic Dictionary blog can be found at SatanicDictionary.com. About a week ago, I visited Spoonbill and Sugartown Booksellers in Brooklyn. Perusing my favorite shelves, I espied a title of preciously rare, immediate, and personal resonance: American Vaudeville as Ritual. As a writer, cartoonist, musician, comedian, and Satanist, I found this an unusually promising resource for my studies. And I was not disappointed! Written by Albert F. McLean, Jr., a professor with a Harvard Ph.D. in American Civilization, this text was published in 1965 — a year before Anton Szandor LaVey founded the Church of Satan. LaVey gave ample credit to his influences: diabolically insightful predecessors from whose works, as well as his own life, he distilled the principles of Satanism. Though I don’t know whether LaVey was aware of this particular publication, I suspect it would have felt perfectly at home in his library. This highly readable academic work explores truly Satanic principles within the context of American entertainment, focusing on vaudeville from the late nineteenth century to 1930 — the year LaVey was born. American Vaudeville as Ritual refers to figures specifically mentioned in the Church of Satan’s recommended reading lists, including Horatio Alger, Herbert Spencer, Jack London, and H. L. Mencken. Its vocabulary alone reflects a sincere grasp of the concepts and practices at the core of Satanism. Of course, this is not to suggest that the author is a Satanist. However, McLean, going against the academic grain, tapped into a magically carnal undercurrent, communicating its dynamics with remarkably sensitive wisdom. Here the text criticizes two Satanic sins: Forgetfulness of Past Orthodoxies and Lack of Perspective. It also embraces the concept of secular magic, which is essential to the Satanist’s practice of Lesser Magic and certain works of Greater Magic that would go unnoticed by most people as genuine sorcery. “Committed to no particular tradition, capable of infinite variations and permutations, alien to all of the formalized modes by which educated persons communicate, the ritual of entertainment could absorb public sentiment and respond to it immediately. Ritual, as it has manifested itself throughout time, has been dynamic and effervescent, always evading the attempts of language to confine it. And within the heterogeneous society of the American city, composed of many peoples from many cultures, it was precisely this active, elusive form of expression which could be most effective. Vaudeville was catholic in its tastes, hospitable to the most ambiguous and contradictory symbolisms, open to old myths but also busy building new ones. Whereas the popular myths which served it were pointed and restrictive — symbolized through stereotyped characters and stories — vaudeville itself remained mobile and elusive as a form, capable of shifting in coloration and emphasis from one performance to the next. Where do I begin? Apply these ideas to a more individualistic point of view, and the resonance is astounding. We Satanists, a cross-cultural meta-tribe, freely borrow from seemingly incompatible sources of inspiration, blending them into idiosyncratic syntheses that fulfill an infinite variety of individualistic needs. Our magical workings, conducted both within the ritual chamber and through other evocations, are exercises in intellectual decompression — an aesthetically-induced emotionalization that LaVey suggested was all the more necessary for the intellectual. And while I would not say we focus on stereotypes, we do revel in the powerful conceptual embodiments found in archetypes. Many Satanists have little or no interest in the traditional accoutrements of Satanic ceremony, and may find more inspiration in the creation or enjoyment of other sensory catalysts. That can include physical environments, works of literature, and even certain television programs. Indeed, the Satanist has the unique privilege of genuinely religious experiences that can appear thoroughly mundane to the average person — or even to another Satanist. McLean’s mention of feeling out the “right combinations” brings to mind LaVey’s essay, “The Combination Lock Principle,” from The Devil’s Notebook, in which he emphasizes the inimitable nature of one’s personal system of sorcery. Prescribed methods can be a useful framework, but should be adapted, even until they are unrecognizable, to suit the Satanist’s personal needs. Of course, that sometimes does mean following tradition down to the letter. However, in my experience, that is rarely the case. This dynamic will be familiar to the Satanic student of Greater Magic. The power of any ritual is in its ability to heighten the emotions, and thus expand the will, through custom-tailored, personally satisfying stimuli. Of course, one need not feel overwhelmed by urban existence in order to benefit from this method. But Greater Magic through discriminating engagement with “entertainment” sure helps me to survive the daily grind in New York City! As might be expected, the Satanic nature of entertainment has not been lost on the religious establishment. To this day, Christian fundamentalists and their Islamic counterparts, along with a joyless assortment of other death-worshiping religionists, protest these life-enhancing creations. As we’ve seen on the news — and sometimes in our personal lives — their irrational, totalitarian responses range from obnoxious comments to fatal acts of terrorism. I encourage the reader to hunt down a copy of this outstanding book, as this essay only touches upon a few of its ample moments of Satanic resonance. We often note that Satanism is the only religion that takes pride in its showbiz elements, even though all religions are rooted in fetishistic theatricality. American Vaudeville as Ritual demonstrates this more clearly and thoroughly than I have seen anywhere else. It has certainly helped me to further recognize and articulate the principles of Satanism within the context of entertainment. What a rare pleasure. The newest book on my shelf is already among my most cherished grimoires. And I just wrote a book report — for fun. McLean, Albert F., Jr. American Vaudeville as Ritual. Kentucky: University of Kentucky Press, 1965. Print. Gilmore, Peter H. The Satanic Scriptures. Baltimore, MD: Scapegoat Publishing, 2007. LaVey, Anton Szandor. The Devil's Notebook. Venice, CA: Feral House, 1992. LaVey, Anton Szandor. The Satanic Bible. New York, NY: Avon Books, Inc., 1969. As Magus Peter H. Gilmore explains in The Satanic Scriptures, Satanism's current watchword is: Justice. As it turns out, it goes both ways: a Justice can watch words. Bear with me. Yesterday, the United States Supreme Court debated the issue of prayers at town board meetings. Normally, this would be of interest exclusively as a matter of separation of church and state. That principle is always significant, and has special implications for Satanists. But, in this exchange, what caught my ear was the conspicuous absence of the very term "Satanist." Justice Samuel Alito asked for an example of a town hall prayer that would be acceptable to an assortment of religions, including, among others, Christians, Buddhists, and Wiccans. Justice Antonin Scalia, playing Devil's advocate, added atheists and devil worshipers to the list. Despite the laughter in the courtroom, this successfully illustrated that it would still be insufficiently inclusive to address town hall prayers to a generic "almighty." Getting to my point: Scalia mentions "atheists" on the one hand and "devil worshipers" on the other. Phew! Living up to his title, the Justice did not drag Satanists into this. Since we're already covered by "atheists," Scalia's use of "devil-worshipers" in this case introduces a welcome specificity that doesn't risk conflating Satanism and, lehavdl, devil worship. It seems like an almost deliberate choice. After all, public figures usually love the word "Satanist." It's even the more efficient choice, being two syllables shorter! But the Justice put in about 66.6 percent more effort, resulting in a much clearer argument that kept Satanism out of the whole mess. Perhaps I'm more pleased than I should be. The truth is, most people probably still don't know that Satanists are atheists. Nonetheless, this vocabulary-obsessed Satanist was excited to hear a legislator managing not to use "Satanists" and "prayer" in the same breath. (Oops!) I'm very happy to be thrown in with the atheists and not mentioned by name, because the last thing Satanism needs is another ignorant association with theism. This isn't exactly the answer to our – ahem. Even so, on some level, I think that this little moment demonstrates the potential for public discourse to approach Satanism in a more informed manner. But at the very least, as long as they aren't using our word, they aren't misusing it. On Wednesday, the sixth of June, the incomparable Ray Bradbury died at the age of 91. Something Wicked This Way Comes, his haunting novel about a sinister traveling carnival, is included in the recommended fiction reading list of Blanche Barton’s book The Church of Satan. As diabolically evocative as that book is, though, it was not Bradbury’s greatest contribution to my Satanic education. My personal favorite Bradbury work is Zen in the Art of Writing, which overflows with passionate wisdom for embracing the genuinely awesome experience of a profoundly creative life. Aside from The Satanic Bible, this has probably been the most influential book in my own evolution. Nietzsche ranks high on that list, too. But Bradbury captured, distilled, and transmitted the Nietzschean lightning within the space of a single, concise, and indispensable manifesto. It is fitting that Bradbury left us on a Wednesday. That day is named for the warrior-poet god Wotan, who embodies wisdom and the full spectrum of its power, and whose name means “frenzy.” My lifelong affinity for Wotan, also known as Odin, owes a great deal to the empowering, poetic frenzy of Ray Bradbury. 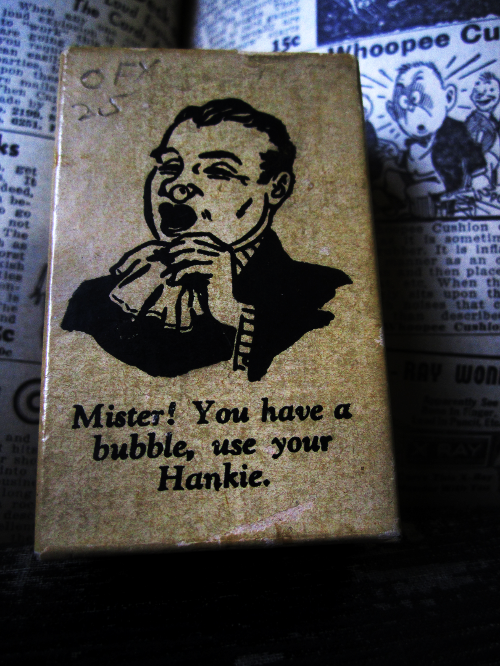 In observance of April Fool’s Day, I am sharing photographs of rare novelties from my collection. These are particularly interesting because they are featured prominently in the work of Anton Szandor LaVey. LaVey found great wisdom where others have found mere amusement, little of interest or, in many cases, nothing at all. This is the true occult. One especially overlooked area of this realm of hidden meaning is that of the prank. 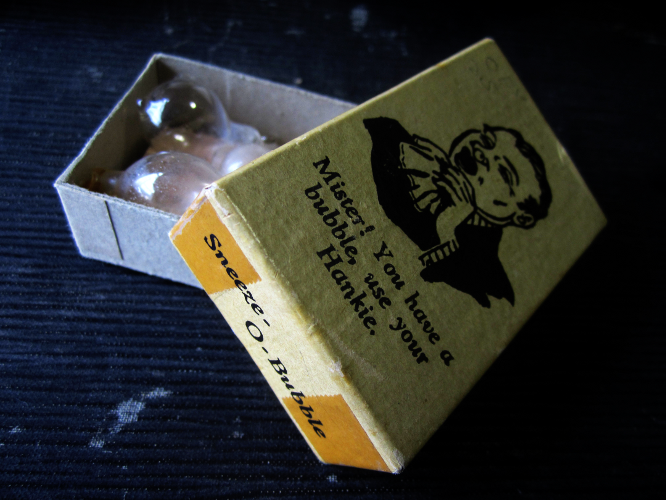 Often perpetrated against innocent friends and acquaintances, pranks are treated differently within Satanism. As LaVey said more than once, it is far more fulfilling to employ unpleasant surprises toward the balancing of egos and as a form of humorous revenge. He also discussed more than one specific gag, including a couple from the old Johnson Smith & Co. Catalogue, which is featured in the Church of Satan’s recommended reading list. LaVey called it his Necronomicon. On the dedication page of The Devil’s Notebook, LaVey mentions the inventor(s) of the Sneeze-O-Bubble. 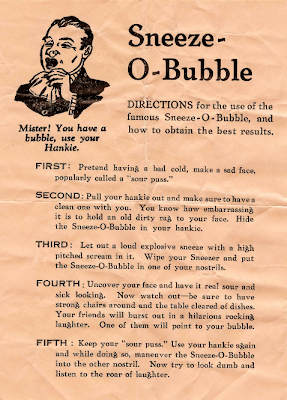 In Satan Speaks!, he dedicates an essay to the artful use of a rubber “nose bubble.” I have always deeply enjoyed that essay, and it has seemed to me that its subject is none other than that enigmatic Sneeze-O-Bubble. I had the good fortune of finding this incredibly rare gag on eBay. 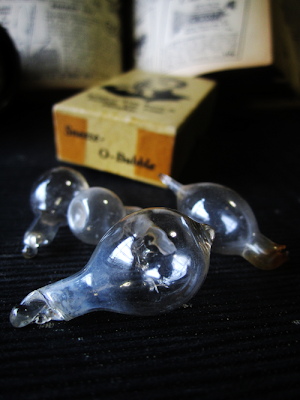 It is a set of four bubbles, and they appear to be made of blown glass. Perhaps this is an earlier version of LaVey’s nose bubble. Either way, it is one of my most cherished possessions. I took some time to photograph it for both my own pleasure and this blog. This is the top of the Sneeze-O-Bubble box. In the background is an open copy of the 1941 Johnson Smith & Co. Catalogue. Opening the magnificently decorated box, one reveals the faux mucus globules and, nestled beneath them, a pink instruction sheet. And here are the legendary bubbles themselves. What schnozzes have these delicate baubles graced in eras past? Though crystal-clear, these replicas of inflated snot are among the most mysterious relics in all Americana. But what good are nose bubbles if you don’t know how to use them? Study this sheet, stick a few Sneeze-O-Bubbles in your jacket pocket, and you’ll be good and ready for that next cocktail party or family gathering. Again, you should also read (or re-read) LaVey’s excellent tips and scenarios for artificial snot in “The Nose Bubble,” from Satan Speaks! Another sacred object I have managed to acquire is the Rado Echo Voice-Tester, which LaVey discussed in the documentary Speak of the Devil. This cruel device conceals a particularly nasty surprise. To learn more about it, see the film. It is chock-full of wisdom, including an entire segment about “practical” jokes. That’s where you’ll find an anecdote about this wicked little item. 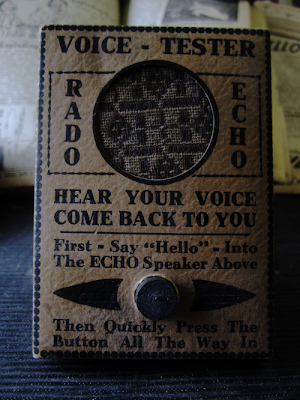 This is the face of the “voice-tester.” The box is made of cardboard, and the old-fashioned “speaker” is made of cloth. Here, you can clearly see the tester’s wooden button. Anyone who has seen Speak of the Devil knows what it does. Even if you haven’t, I’m sure that you get the point. Enjoy an impish April Fool’s Day, my mischievous readers! And remember: it’s funnier when they deserve it!